While the popular anime Charlotte didn’t quite make the cut for our must watch anime of this season, watching it has encouraged me to go back and check out other works by writer Jun Maeda: namely his 2010 hit, Angel Beats. Angel Beats is the story of a group of dead teenagers—“living” in a sort of purgatory high school world as they await reincarnation. When the recently deceased boy Otonashi arrives in the world, however, he finds it more a warzone than a school, as the teens have rejected the idea of leaving this current life and instead battle against the Angel who serves as the student council president. What follows is an anime that switches between slapstick humor and despair-inducing sadness. Much of the anime focuses on the antics of “Class SSS”—as the dead students are collectively known. As they are already dead, they will recover from any injury; so much of the humor of the show is physical—with the characters dying in some gruesome yet comical ways. And they have plenty of chances to “die.” Their leader, Yuri, is constantly sending the class on crazy missions. These range from being super energetic all the time and performing underground concerts to entering death trap-filled areas and attacking the Angel head on. Though wildly different, each has the same goal: to overwhelm the Angel in some way and get her to contact God—then Yuri can give the divine creator a piece of her mind. This is where the inherent sadness of the series comes in. Each member of Class SSS had a horrible childhood of some sort—and died before ever reaching adulthood. Some were abused, others had physical disabilities, and some just had their otherwise happy childhoods ripped away in one traumatic moment. This is why they are unified in their cause: Why would anyone bow to the will of a god who made them live such horrible lives? All that Class SSS knows for sure is that if you play along with this world—filled as it is with “normal” students and teachers (whom they refer to as “NPCs”)—you will disappear. So Class SSS fights for their continued existence by being as abnormal as possible. What Class SSS fails to see, of course, is what this world truly is. The world they exist in is an idealized school life—filled with all the classes, friends, and activities one could ever want. Moreover, they can quite literally create anything they may want or need simply by molding dirt. (Class SSS has used this power to create its large amounts of firearms). In other words, the purgatory world is actually a chance for all of them to live the perfect childhood they were denied. Why people disappear is simple. When one of them feels content and has learned to accept his or her life or overcomes regrets by doing in purgatory what was not possible to do in life, the student disappears—soul cleansed and ready for another shot at life. Purgatory is a gift—almost an “I’m sorry” from God. But without receiving from God any clear explanation about the purpose of the world, Class SSS misconstrues its purpose and rails against the machine. Angel is the only one who understands the true purpose of the world at the get-go—hence why she goes along with the school life fantasy and tries to get the others to do so as well. Of course, in the minds of Class SSS, she must be working for God and trying to force them to give up their existence and disappear. It’s a good conflict that, in the end, makes both sides sympathetic. 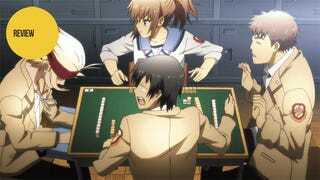 Thematically, Angel Beats is also a fantastical look at what it is like to be a teenager. The teenage years are that terrible time when you feel like you can’t die yet are also at your most emotionally vulnerable. In the case of Angel Beats, this is literally true. The members of Class SSS can’t die and so physical danger means little. Yet at the same time, it is raw emotion that drives them—the betrayal they feel at having to have led such terrible lives in the past and now to face obliteration (in the form of reincarnation) at the end of it. Moreover, as teenagers, they rebel against authority, convinced that not only are they the good guys but also that they know better than said authority (in this case God, Angel, and the purgatory school). In a real sense, it is growing up that frees their souls to return to the mortal world. Much of growing up is learning to accept the world as it is—that life is rarely fair. It’s only by coming to peace with this fact that you can be happy. If not, you are forever trapped in an eternal war of your own making, fighting against those who truly only want to help you. But while thematically strong, Angel Beats does have its weaknesses. The foremost of these is the scatterbrained structure of the plot. While the first few episodes set up the main conflict—and often use it to hilarious results—in the latter half, the series keeps setting up conflicts but never resolves them. Instead, each conflict is replaced by another conflict. For a while, it looks as if Angel will be turned dark—becoming a truly malicious enemy instead of an unrecognized ally. Yet, despite the buildup, nothing comes from this. Instead, this is replaced by the conflict of Otonashi and Angel deciding to band together in secret and help people find peace and reincarnate—basically making them the enemies of Yuri who could discover them at any moment. Yet that conflict never comes to a head either as the shadow people begin appearing and attacking Class SSS. Basically, the whole last half of the series is like bowling—only whenever you throw the ball, the pins are picked up immediately and reset with a new frame. The other problem the series has is that some of the characters backstories are left frustratingly mysterious. For each member of Class SSS, there are two key moments: the tragedy in their lives and how they died. Sometimes, these are connected. Other times, not. Yet, even with the two female leads, Angel and Yuri, much of their histories are left secret. This is even more problematic with Angel as the series’ tragic ending is dependent upon her backstory. Without knowing her past, the anime’s end seems to make little sense—especially with what we know about the world. While the final conversation between Otonashi and her should put her at peace, we’ve seen that it is possible to stay in the purgatory world simply by regretting that you would leave someone you care about behind. But as she disappears, we can only infer she does not wish to stay. However, without knowing more of Angel’s backstory, it’s impossible to understand why she would choose reincarnation over life with him. So as the final credits rolled I found myself more confused than heartbroken. Angel Beats is a rare anime able to be both comedy and tearjerker without either feeling out of place in either the world or narrative. The purgatory world, its rules, and its mystery are beautifully handled; and the thematic exploration of teenage life is something any viewer over twenty will be able to identify with. And while the anime does have its weaknesses in the plot structure and characters’ backstories, the chances are you’ll be too busy laughing or crying to notice. Angel Beats can be watched for free on Crunchyroll and Hulu.